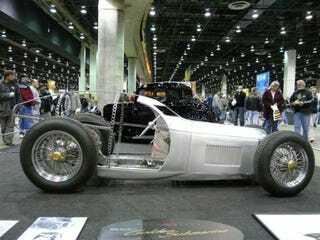 We saw the beginnings of the recreation of Barney Oldfield's Golden Submarine last year, but at this years' 2008 Detroit Autorama, some very noticeable progress has been made on the car. As you can see, the incredibly detailed, lightweight frame has been worked out and sheetmetal work has begun on the sleek little speeder. We were very impressed with the crazy amount of work evident in the drilled T-cross section body frame, it looks to us as though the T-section was cut as two pieces, then shaped and welded together - incredible. The slick body work is completely flawless and really impressive in person, especially that one piece grille. Now that the shape is beginning to come together, it's much easier to imagine the finished product and just how much it will resemble the original. Hopefully it will be wrapped up by the next Autorama, so we can see just how fast this Zetec powered bullet will be.